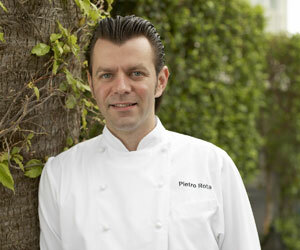 TravelsinTaste.com recently sat down with rising culinary star Pietro Rota, executive chef of the newly opened La Marea at the Tides Hotel in South Beach, to discuss his life-inside the kitchen and out-as well as his passions, his peeves and his palette. Chef Rota was born in Milan, Italy, and began his culinary career at age 13 in the nearby city of Bergamo, where he was a dishwasher at a local restaurant. Aspiring to move beyond the sink, to the stove, he later attended culinary school at the prestigious Professional Institute of State in San Pellegrino. Upon graduation, from 1992 until 2001, he worked at Ristorante Avvoltoio Nero, a bustling local eatery. There, he continued his pursuit of a chef's life as an apprentice under Chef Ivan Callioni, who taught him not only the techniques for preparing traditional Italian cuisine, but also its history. Callioni's passion for food inspired Chef Rota at an early age, and he carried that inspiration with him to his next kitchen, at Ristorante Lo Stivale in Brazil, where he was chef for three years before moving on as executive chef at Ristorante Osteria Del Piano, back in Italy. Despite cooking all day for others, Chef Rota still enjoys cooking for himself, too. After all, even chefs have to eat at home sometimes. His favorite dish to prepare at home, away from the hustle and bustle of the restaurant, is pasta, he says. His favorite pasta dish is spaghetti aglio olio-spaghetti that's prepared with garlic, olive oil and chili flakes-that he enjoys pairing with a chilled bottle of Santa Margherita Pinot Grigio. Running a restaurant is an intricate endeavor, filled to the brim with both pros and cons, just like any other profession. According to Chef Rota, the pros are many. He thoroughly enjoys, for instance, making each and every one of his diners happy and satisfied. It is of the utmost importance to him. He's used to making customers ecstatic, after all, thanks to former gigs in California-including La Loggia in Studio City, Sapori in Marina del Rey and, most recently, the famed Il Sole in West Hollywood, a frequent haunt of many Hollywood notables—where customers routinely demand the absolute best service. The industry is not without its rubs, however. Among Chef Rota's pet peeves are when his chefs or line cooks prepare his dishes below his standards-particularly after he has spent hours training and showing them how to prepare them. This presents a problem, he says, because food cannot go out of the kitchen without his approval, and each sub-par dish must be completely redone in order to meet his strict but reasonable standards of approval. Luckily, there are no sub-par dishes in Chef Rota's newest kitchen, at La Marea-Spanish and Italian for "the tides"-in South Beach, where he ensures the utmost quality assurance so that customers have the most delightful experience possible. Planning a trip to South Beach? Learn more about Chef Rota and his thoughts on future culinary trends, as well as the South Beach dining experience, by watching an exclusive video interview with him, and watch him preparing his delicious creations in La Marea's kitchen. Or, find out more about the Chef by reading his biography and his restaurant, La Marea, by reading TravelsinTaste.com's exclusive restaurant listing.